Can anyone recommend me some free VSTs? I have tons of them, like Synth1, Dexed, PG-8X, SQ8L (I may never need a real Ensoniq ESQ-1 or SQ-80), and many others. I even have Combo Model F and V. So are there any standouts that I might like? Re: Can anyone recommend me some free VSTs? 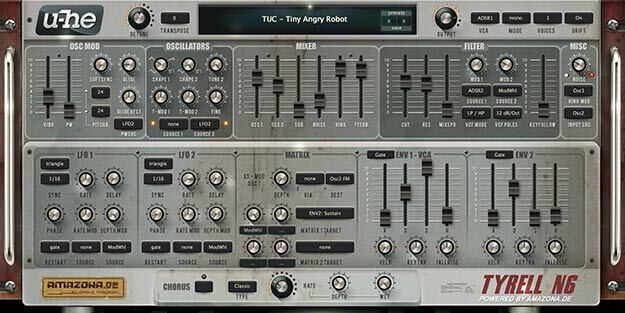 u-he Tyrell N6 Nice sounding VA, my favorite freeware synth. Comes with a good preset library, but easy to program...like an expanded Roland Juno. Nearly anything by U-he(Tyrelln6, Podolski), OBxd, ShortCircuit(sampler),there are these Polish ones with difficult names...Brzoza, Swierk and Cedr, Chimera. VST4FREE.com, VSTPlanet.com, and KVRAudio.com have the biggest listings. KBrown has a new and very extensive collection of free VSTs. There is the ElektroStudio collection of classics no one else has. Sonic Projects has a small free version of their OP-X. Tubeohm has four free versions that are amazing. I just added a link to the entire H G Fortune collection. B Serrano synths are excellent, as are de la Mancha and DSK. I have so many free VSTs I have downloaded (171GB!) and only a fraction that i have installed. You can go nuts but after a while you have to learn how to pick and choose, otherwise you just drown. gridsleep wrote: VST4FREE.com, VSTPlanet.com, and KVRAudio.com have the biggest listings. KBrown has a new and very extensive collection of free VSTs. There is the ElektroStudio collection of classics no one else has. Sonic Projects has a small free version of their OP-X. Tubeohm has four free versions that are amazing. I just added a link to the entire H G Fortune collection. B Serrano synths are excellent, as are de la Mancha and DSK. I have so many free VSTs I have downloaded (171GB!) and only a fraction that i have installed. You can go nuts but after a while you have to learn how to pick and choose, otherwise you just drown. I got the ElektroStudio and B Serrano stuff. I particularly like VST4FREE.com because you would be surprised what one can find, I have a sitar and accordion plugin from that site, not that I'll need them, but they'll be useful.